Heavy Duty Greenhouse Staging with shelf 6' x 22. 180cm x 55cm, height 88cm/35. 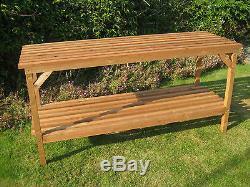 This well made staging will provide you with a sturdy workbench for your greenhouse Comfortable working height Comes complete with the bottom shelf, which is 30cm off the floor The wood is Scandinavian pine, which has been treated with timber protection solution, ideal for greenhouse use Supplied flat pack for easy self assembly - Top, Shelf and Leg frames come preassembled. Quality screws and assembly instruction supplied. 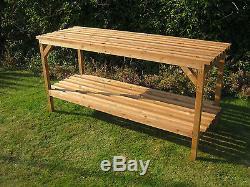 This quality staging is professionally made in our own UK based workshop. AB; IV; KA27-28; KW ; PA20, 36,38+; PH15+; PO30 -41. The usual service will resume after 2nd January 2019. We wish you all a Merry Christmas. The item "6' x 22 Greenhouse staging Wooden Heavy duty 6ft potting table" is in sale since Thursday, June 16, 2016. 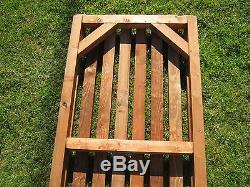 This item is in the category "Garden & Patio\Garden Structures & Shade\Greenhouses & Cold Frames". 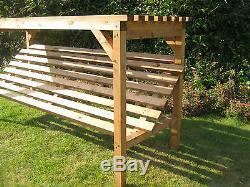 The seller is "gardening4us" and is located in LLysfaen, Conwy. This item can be shipped to United Kingdom.